We reached at Bandra Tel. Exchange around 4pm and the bus fellow said the can’t transport the cycles! Made a few calls to the bus booking fella to ensure our cycles were on-board or on-ceiling. At Vashi when the bus made a stop, it loaded around 100+ boxes of Apples, Grapes and other fruits, our cycle unstrapped and restrapped later. Bus stopped, we were half asleep, uncomfortable. Probably it was past midnight.. It was around 3am at Lanjha, Ratanagiri. It was cold! The Bus moved on and I had to flush out things luckily bus had stopped early morning for diesel. It reached Mapuca waited for another 30mins to get the fruits off its ceiling and moved ahead for Panjim. We started at Panjim around 8.30am heading for our first halt of the trip at Canacona. We stopped at Margao and had breakfast. 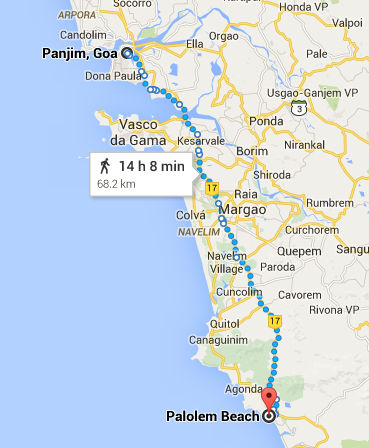 A little chat with my sister in Goa, and she suggested we should stop at Palolem beach instead of Canacona. 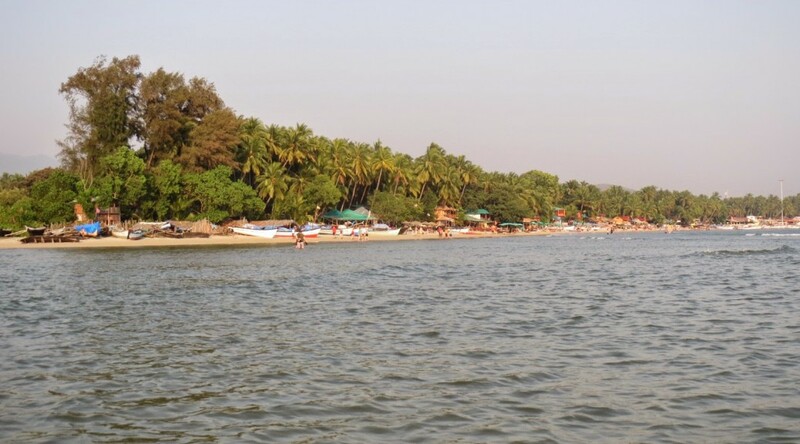 The ride from Margao to Cancolim was through towns, villages… But then… The first ghat on our trip welcomed us.. It was hot around noon and the ghat never seemed to ease. It climbed and climbed… The road, NH-17 Panvel-Edapally was just wide for 2 way traffic and in this section through barren hills. It was just too much for me. At a point I started pushing the cycle, Surya too followed suit. A little further as it seemed it eased, we mounted back on and started only for another winding climb. Our heads throbbing with the excessive climb and HEAT! we stopped for relaxing ourselves. Another 10mins later we were back. Probably the inadequate sleep in the night and first day of our trip was taking its toll. Later however, the road had to descend for the beach.. and it was much relaxing for us. We reached Palolem beach around 2pm and got into a shack for lunch. Which wasn’t great at all! My food-experience in Goa wasn’t ever good. Today just seemed same. Later we found a home-stay and got to cleaning. Washing clothes then having bath. This would be our defacto Standard-Operating-Procedure after finding a lodge / room.